Prime Minister Rami Hamadallah offered condolences to the families of three victims of a deadly Israeli raid in the occupied West Bank on Monday. The prime minister was accompanied by the ministers of interior, health and transportation. The democratic front for the liberation of Palestine (DFLP) called on the Palestinian Authority (PA) to join the international criminal court and take legal action against the Israeli regime for killing three Palestinians in Qalandiya refugee camp on Monday. A senior DFLP official demanded, in a press release on Tuesday, the PA to join the international court in order to curb Israel's aggressive actions against the Palestinians in the occupied territories. 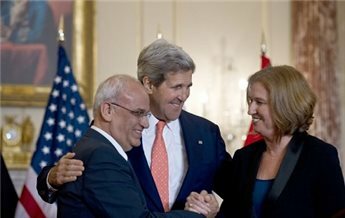 He denounced the PA leadership for backtracking on its intention to join the international criminal court and some UN organizations in order to return to the negotiating table and without demanding an end to Israel's settlement activities and human rights violations in the occupied Palestinian territories. He said that the PA leadership's submissiveness to the US-Israeli pressures renders the Palestinian people easy prey to the daily attacks launched by the Jewish settlers and the Israeli occupation forces. The DFLP official called on the PA to withdraw from the peace negotiations with Israel in compliance with the national consensus. In a related incident, the Palestinian national and Islamic political forces in Jenin city and its refugee camp organized a massive rally last night to protest the Israeli killing of three young men in Qalandiya refugee camp. The participants chanted slogans and carried banners condemning the PA's persistence in its negotiations with the Israeli occupation regime despite its crimes and violations against the Palestinians. A facebook youth group called for a symbolic funeral march next Wednesday in Ramallah city to demand the Palestinian Authority (PA) to immediately stop its negotiations and security cooperation with the Israeli occupation in response to the killing of three young men in Qalandiya refugee camp by its soldiers. The facebook page, which was named "the blood of our martyrs is not cheap" was established by a group of young activists living in the West Bank. The group strongly denounced Adnan Addameri, the spokesman for the PA security agencies, for describing in remarks on Monday the Qalandiya crime as an Israeli attempt to torpedo the peace negotiations. "Do we have, after this crime, to frustrate the occupation's attempt to destroy the negotiations and hang on to it more and more?" the group questioned. The group also demanded the PA to end its restrictions on the Palestinian resistance in the West Bank and give it a free hand to restore the dignity of the Palestinian people which was violated by the occupation in the camp. The protesters will march from central Ramallah towards the PA headquarters, carrying symbolic coffins draped with Palestinian flags. Violent clashes broke out on Monday between Israeli soldiers and angry young men in Al-Khalil city following the deadly attack on Qalandiya refugee camp, which led to the killing of three young men and the injury of many others. Eyewitnesses told the Palestinian information center (PIC) that young men clashed with invading troops in BaB Azzawiya and Shalala areas in central Al-Khalil. The young men confronted the troops with throwing stones and some of them were able to pick up smoking tear gas canisters and hurl them back in the direction of the occupation forces. One young man was reportedly rounded up during the events. The confrontations also spread to Al-Fawwar refugee camp to the south of Al-Khalil, where dozens of angry young men torched tires and clashed with the invading troops, who showered them with a hail of tear gas grenades. A growing popular rage in the west Bank started in the West Bank after the Israeli occupation forces (IOF) at dawn Monday killed three young men and wounded many others during a violent raid on Qalandiya refugee camp, north of occupied Jerusalem. Meanwhile, the IOF closed on the evening of the same day the northern crossing of Al-Khalil city for about two hours and prevented the Palestinian vehicles from going in or out. Eyewitnesses told the Palestinian information center (PIC) the Israeli soldiers stationed at a military watchtower near the entrance to Halhoul town, north of Al-Khalil, set up a checkpoint and embarked on searching vehicles and checking the IDs of passengers, especially young men. The soldiers at the checkpoint forced many young men to leave public buses and detained them for some time before they let them go. In a separate incident, unruly armed Jewish settlers living in seized property in Tel Rumeida neighborhood in Al-Khalil attacked on Monday Palestinian passersby and homes. Residents in the area reported over the phone to the Palestinian information center (PIC) that armed Jewish settlers threw stones and empty bottles at their homes in the neighborhood, which caused damage to Palestinian cars, and chased citizens. Israeli and Palestinian negotiators met in Jericho on Monday to discuss the peace process, despite an announcement by the PLO that talks had been canceled following the killing of three Palestinians earlier in the day. A Palestinian official, who chose to remain anonymous, told the Xinhua News Agency that the two negotiation teams met in the house of chief Palestinian negotiator Saeb Erekat in Jericho. "Erekat presented to his Israeli counterparts a string protest to the earlier killing of three Palestinians by the Israeli soldiers' gunfire in northern Ramallah," the source said. The US State Department, which is mediating the talks, insisted that no meeting planned as part of the ongoing peace process had been cancelled. "I can assure you that no meeting has been cancelled," State Department spokeswoman Marie Harf told reporters in Washington. "As we have said the parties are engaged in serious and sustained negotiations," Harf said. "We are not going to announce when every meeting takes place. But again I can assure you that no meeting has been cancelled." Earlier, a Palestinian official told AFP that "the meeting that was to take place in Jericho ... today was cancelled because of the Israeli crime committed in Qalandia today," referring to the killing of three Palestinians in an overnight arrest raid. Israel's Channel 2 news reported that a meeting had taken place between negotiators on Monday after the killings in Qalandia, but Israel tried to minimize coverage to avoid embarrassing the Palestinian side. Thousands of Palestinians participated in the funeral of the three Martyrs that passed away on Monday morning during the Israeli forces raid on Qalandia refugee camp north of Jerusalem. The funeral of Rubin Al-Abed Fayez Zayed, Younes Jihad Abu Sheikh Jahjouh and Jihad Aslan initiated from in front of the Palestine Medical Center towards Qalandia refugee camp as the Martyrs were transferred in ambulances and upon arrival to the refugee camp, each Martyr was carried to his house so that his family and friends can take the last look at him. The funeral march was fronted with masked individuals who heavily fired shots in the air, a tribute to the Martyrs’ spirits and chanted slogans calling to avenge the assassination process. 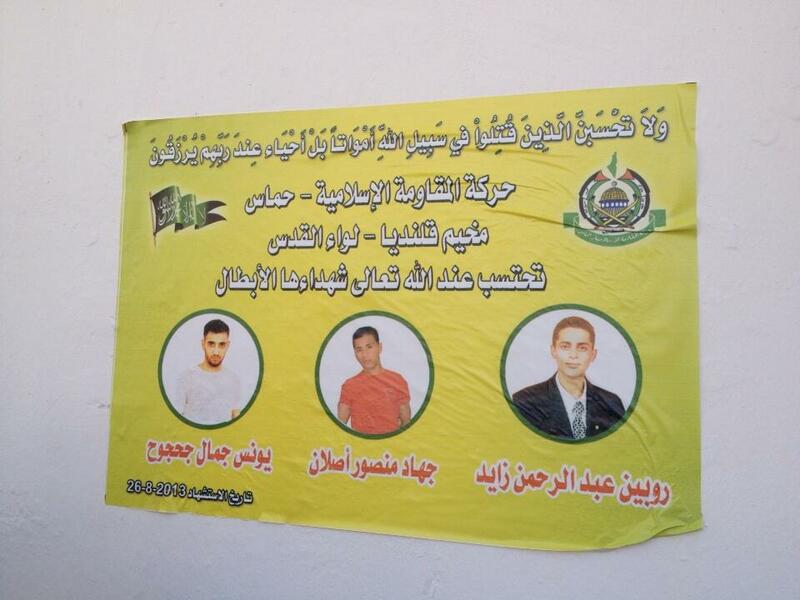 After performing the funeral prayer, the three Martyrs were buried in the refugee camp’s cemetery. It is noteworthy that Rubin is a freed prisoner who was free within the “Shalit” deal nearly two years ago, and Younes Jahjouh is a freed prisoner and is in his first year at Modern Media Institute which is part of the University of Jerusalem. After the funeral was over, clashes broke out between the young men and the occupation forces in which the forces fired sound bombs, tear gas bombs and rubber bullets towards the young men who threw stones and empty bottles. Dozens of passers-by from the camp and the area suffocated from the tear gas and several others were injured with rubber bullets. 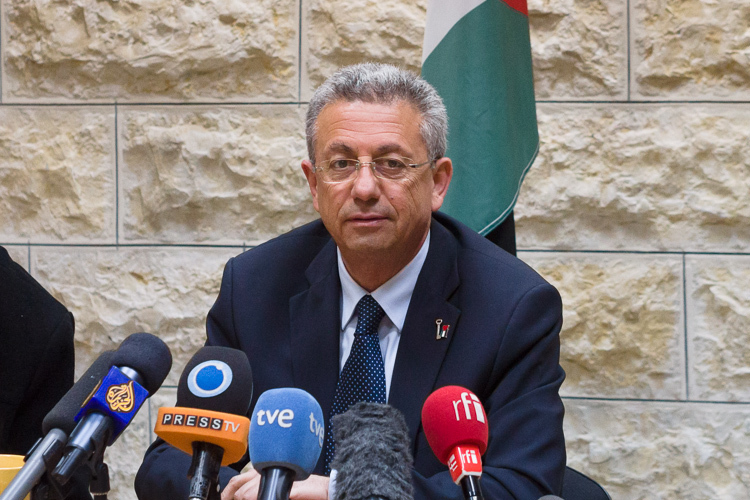 On Monday morning, 26 August, Dr. Mustafa Barghouti, Secretary General of the Palestinian National Initiative, expressed his horror and disgust of the Israeli occupation’s continued crimes. Early this morning, three unarmed Palestinians, Rubin al-Abed, 32, Yunis Jahjuh, 22, and Jihad Aslan, 20, were killed by live ammunition fired by Israeli soldiers; 15 others were injured. UNRWA deeply regrets to confirm that one of its staff members, a 34-year-old father of four, was shot dead by Israeli forces and killed instantly in an operation in Kalandia refugee camp in the occupied West Bank at approximately seven o'clock this morning. Credible reports say that he was on his way to work and was not engaged in any violent activity. He was shot in the chest. Another UNRWA staff member, a sanitation laborer, was shot in the leg during the same operation and is in a stable condition. An UNRWA investigation is ongoing. Today’s killing took place during an incursion into Kalandia refugee camp during which three people in total were killed and about twenty injured, some of them seriously. UNRWA condemns the killing of its staff member and calls on all sides, at this delicate time, to exercise maximum restraint and to act in accordance with obligations under international law. Israeli death squads of the so-called border police operating under cover, reportedly dressing in women clothes, killed three Palestinians in the Qalandia Refugee camp near Ramallah and left another 19 persons injured in an operation which led to the arrest of dozens of political activists. The death squad operation was coordinated with the so-called Palestinian Authority (PA) security forces and was directed against some political activists from Hamas who had been released by the Zionist regime during the Gilad Shalit exchange. PA intelligence personnel and militia have arrested several hundred Hamas elements in the occupied West Bank during the past days, following the Egyptian military coup. The PA also banned demonstration or rallies against the military coup and in solidarity with ousted Egyptian President Mohammad Morsi in the small cantons under its nominal control in the occupied West Bank. The PA has used excessive force and other methods of state terrorism to disperse the large number of protesters attending demos in Ramallah and Hebron. Last Friday many journalists were beaten up, their equipment damaged, and the films, tapes and storage devices removed from photo and video cameras in order to hide the brutality of how the soldiers are dealing with civilians during peaceful demonstrations, civilians who want to express their opinion in marches and other legitimate shows of dissent. On the other hand, in the context of the recent series of political arrests, the PA has entrusted the arrest of a number of Palestinian political leaders and activists to the zionist occupation forces in order to avoid criticism from the Palestinian population when its own repressive elements arrest them. Early today morning, at round 5:30 AM and with full knowledge of the PA, the israeli death squads operating “undercover” entered the refuge camp of Qalandia and arrested several well-known Palestinian opposition figures. Palestinian youths of the area protested against the filthy coordinated mission between of israeli soldiers and PA elements. As usual for such occasions, they hurled insults and threw stones at the zionists death squads. A detachment of the IDF Artillery Corps was stationed nearby providing additional cover for the death squad unit. 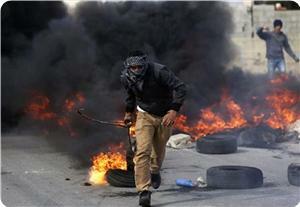 When the protests of the Qalandia youths nearby started, they were alerted and started shooting everywhere. 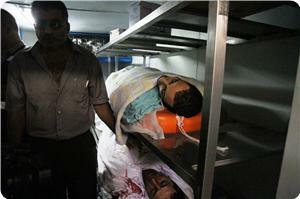 The result was that three Palestinians were killed and 19 injured. All this in order to protect the death squad unit frompretty much defenseless youths. The three victims are Robin al-Abed, 32, who was shot in the chest and died instantly according to; Younis Jihad Abu al-Sheikh Jahjouh, 22, who was also shot dead, and Jihad Asslan, 20, who died Monday morning from his injuries after being pronounced brain dead at a Ramallah hospital. It was later said that among those who were arrested by the israelis was a Palestinian man who had been released from an israeli prison just a month ago. The PA, which had been involved in coordinating this “under cover “ operation with the IDF, was forced to condemn the murder of the three Palestinians in public in order to deflect the huge anger which broke out as a consequence of the operation. PA officials even went so far as to claim that they has “canceled” the so-called “peace talks” which were planned for Monday in Jericho. This is a funny as moot pretense because of course all Palestinians know that the PA “condemnation” and its “decisions” are worth null, as the PA itself is nothing more than a puppet of the American-zionist project in Palestine. The PA should never forget that they are group of criminals who have taken over the dirty work of the occupation and enthroned by their masters as the current dictator regime in Palestine. And their masters will discard them like an old magazine when their usefulness is over. Later, the US State Department on Monday denied reports that a round of US-brokered peace talks between Israel and the Palestinians had been canceled following clashes in the Qalandia of the West Bank. “I can assure you that no meetings have been canceled,” State Department spokeswoman Mari Harf told Reuters. “The parties are engaged in serious and sustained negotiations,” she said. Earlier Monday, a senior Palestinian official stated that the Palestinian envoys to the peace talks canceled a meeting with their Israeli counterparts. 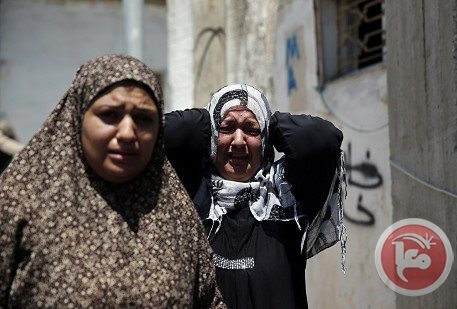 During his meeting with Palestinian Authority (PA) Chairman Mahmoud Abbas in Ramallah on Monday, the Sisi coup's foreign minister Nabil Fahmi reportedly condemned the murderous killing by the Israeli occupation army of three young Palestinians at the Qalandya refugee camp north of Jerusalem. "We condemn the occupation forces' killing of three people from Qalandiya refugee camp," Nabil Fahmi told a joint news conference with his Palestinian counterpart Riyad al-Malki. Fahmi, mainly tasked with explaining and justifying Egypt's bloody coup to the outside world, met Abbas at his headquarters in Ramallah just hours after Israeli occupation forces shot dead three Palestinians at the Qalandiya camp. "The continuation of violence and settlement expansion decreases the chances of success for negotiations, which we hope will succeed," he said. Fahmi also expressed Egypt's support for "Palestinian reconciliation, which the Palestinians must reach," describing the process as a "big challenge." However, it was clear that Fahmi's remarks were conspicuously hypocritical, morally duplicitous and oblivious of cold facts in both Egypt and occupied Palestine. 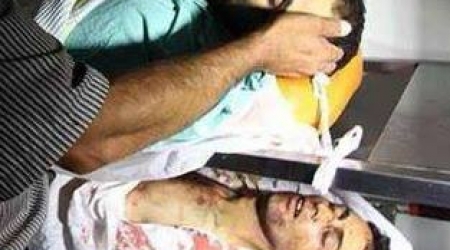 It is true that the Israeli occupation army murdered three Palestinians in the West Bank while Fahmi was in Ramallah. Well. Israel has been murdering Palestinians since time immemorial. In a certain sense, it’s hardly news. But in just three hours two weeks ago, the "heroic" Egyptian army and police showered peaceful Egyptian protesters with bullets from air, tanks, and high rooftops, killing more than 3000 people and maiming thousands others. Hundreds of bodies were burned beyond recognition, apparently to destroy evidence while victims' relatives were asked to sign official papers stating that the murdered victims actually committed suicide. Israel is our existential enemy and ultimate tormentor, and we hardly need the foreign minister of a murderous junta to remind us of this fact. Indeed, if Fahmi possessed an iota of morality or rectitude, he would at the very least resign his post and stop acting as cheap emissary for the murderers of his people. Undoubtedly, he will go down in history as the public relations officer of the nefarious usurpers of freedom and democracy and murderers of innocent protesters. Fahmi said the coup makers were still committed to achieving national reconciliation between Fatah and Hamas. Well, Hamas is part of the Muslim Brotherhood, the very Islamic movement the criminal coup makers in Cairo insist on labeling "terrorist."!! Hence, it is really hard to imagine that any reconciliation effort by the Sisi gang would be honest, evenhanded and fruitful. After all, if the Sisi gang can't treat its own people with minimal humanity and minimal respect, would it be expected to treat Palestinians any differently? In short, we Palestinians don't want to have anything to do with murderers of their own people. Mr. Fahmi you are persona non-grata in Palestine. Angered by the killing of three Palestinian men in Qalandia refugee camp by Israeli forces, youths clashed Monday afternoon with Israeli forces in Hebron. A Ma'an reporter observed young men throwing stones at an Israeli military post stationed at the entrance to Shuhada Street in the center of the Old City. The street has been closed and controlled by Israeli forces since 1994 after a Jewish extremist shot dead 29 worshipers and injured more than 100 while they were performing prayers at the Ibrahimi Mosque. Israeli troops showered the demonstrators with tear gas, stun grenades and rubber-coated bullets. Witnesses said at least two young men were hurt, and another was detained. Clashes took place in different parts of the occupied West Bank Monday [August 26, 2013] after Israeli soldiers invaded the Qalandia refugee camp earlier at dawn, north of Jerusalem, shot and killed three Palestinians, and injured dozens of residents, including at least 15 who were shot by live ammunition. Clashes took place near the Qalandia terminal, while dozens of injuries have been reported as the soldiers fired live rounds, rubber-coated metal bullets, gas bombs and concussion grenades. 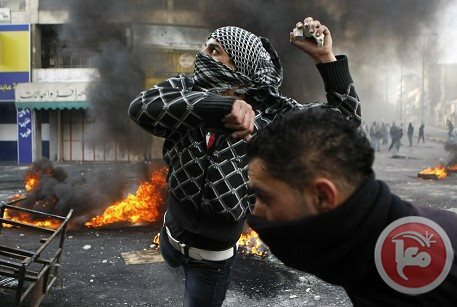 The Palestinian News & Info Agency (WAFA) has reported that dozens of soldiers invaded the Aida refugee camp, in Bethlehem, and clashed with dozens of local youths who hurled stones and empty bottles at the invading soldiers. Medical sources said that several Palestinians in the camp were shot by rubber-coated metal bullets, while dozens suffered the effects of teargas inhalation. Clashes also took place in Hebron, in the southern part of the occupied West Bank, especially in the Az-Zawiya area, and Be’er As-Sabe’ Street in the center of the city. Soldiers fired rounds of live ammunition, rubber-coated metal bullets and gas bombs, and kidnapped several Palestinians. Local sources in the city have reported that scores of soldiers also broke into and searched dozens of homes, and occupied their rooftops using them as monitoring towers. Israeli daily, Haaretz, said that the army kidnapped 30 Palestinians in Qalandia during clashes that took place after the Palestinians held the funeral ceremonies of the three slain Palestinians. It said that the army started in “investigation” in what happened after undercover soldiers of the Israeli military infiltrated into the refugee camp to “arrest some wanted Palestinians”. The army said that “it seems that soldiers did not expect the invasion to be turned into violent clashes”. Amos Harel, a leading media expert on military affairs at Haaretz, questioned the motives of this infiltration and, invasion into the refugee camp, and why this invasion took place in the midst of the newly resumed fragile direct peace talks between Israel and the Palestinians. Nabil Abu Rodeina, spokesperson of Palestinian President Mahmoud Abbas, strongly denounced the Israeli invasion and the killing of the three Palestinians, and said that the invasion “is part of a series of crimes carried out by Israel, and part of Israel’s ongoing violations and escalating settlement construction and expansion activities”. Egyptian Foreign Minister, Nabil Fahmi, also denounced the Israeli crime in Qalandia, and the ongoing Israeli violations. His statements came during a press conference held with Palestinian Foreign Minister, Riyad Al-Maliki, in the central West Bank city of Ramallah. He said that the Israeli escalation and violations limit the chances of successful peace talks, and stated that a Palestinian State must be established next to Israel, with occupied East Jerusalem as the capital of this state. 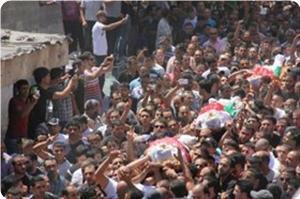 Thousands of mourners on Monday attended the funeral of three Palestinians shot dead by Israeli forces overnight. 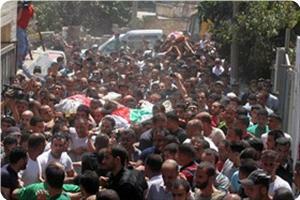 After funeral prayers were said, the bodies of the three men were carried to a cemetery in the camp. Robin al-Abed, 32, was shot in the chest and died instantly, medics said. Younis Jihad Abu al-Sheikh Jahjouh, 22, was also shot dead. 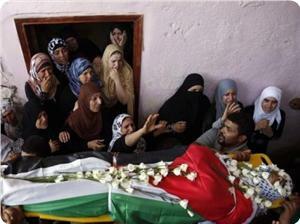 Jihad Asslan, 20, died Monday morning from his injuries after being pronounced brain dead at a Ramallah hospital. 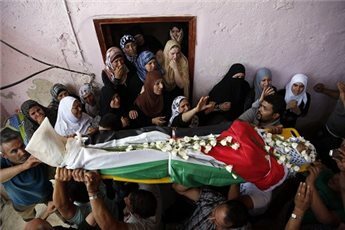 Al-Abed's mother collapsed upon seeing her son's body. He was reportedly on his way to work in a UN office in the camp when he was shot dead. A number of gunmen fired into the air while shouting slogans against the killings and calling for revenge. Clashes broke out at Qalandia checkpoint following the funeral, with Palestinian youths throwing stones and empty bottles at Israeli forces near the military checkpoint. Israeli forces fired tear gas and rubber-coated steel bullets at demonstrators. The killing of the three men has been widely condemned by Palestinian officials and peace talks planned for Monday in Jericho have been canceled as a result of the deaths. 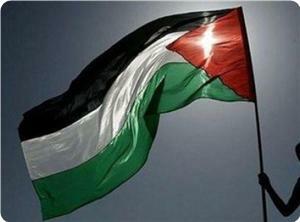 Abbas' spokesman Nabil Abu Rudeinah strongly condemned the incident, calling it a crime against the Palestinian people. PLO official Hanan Ashrawi strongly denounced Israel's incursion into the camp. "Israel's use of excessive and indiscriminate violence and live ammunition in densely populated civilian areas represents a blatant violation of international and humanitarian law." "We call on the members of the United Nations Security Council, the Quartet and the rest of the international community to take serious measures to bring an immediate end to the killing of innocent civilians and to terminate Israel’s impunity," she added. An Israeli police spokeswoman said that border police used "riot dispersal means" to disperse a stone-throwing crowd of 1,500 people, but she could not immediately confirm any fatalities or the use of live fire. 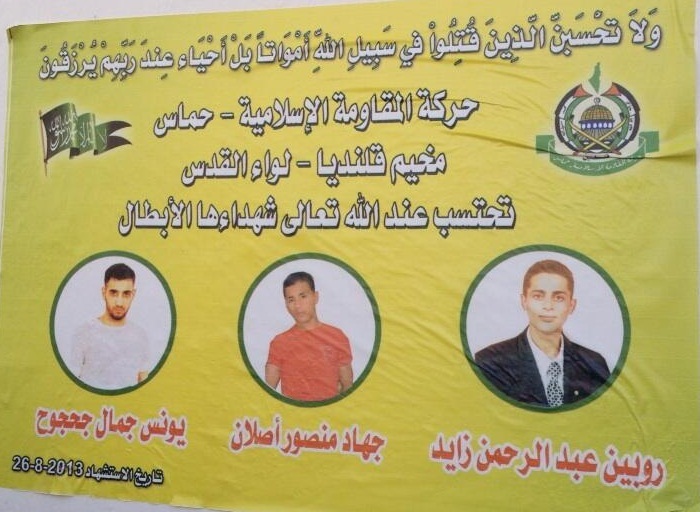 Hamas movement condemned the Israeli killing of three Palestinians in Qalandia refugee camp, north of occupied Jerusalem, at dawn Monday and called for allowing resistance to retaliate. Dr. Sami Abu Zuhri, a Hamas spokesman, said in a press release that resistance should be given free hand to operate in the West Bank to deter Israeli crimes against Palestinian citizens. Hamas described the killing as “cold-blooded murder”, and lashed out at the Palestinian Authority in Ramallah for launching talks with Israel despite its repeated crimes against the Palestinian people. For its part, the Hamas-affiliated change and reform parliamentary bloc called on the Palestinian people in the West Bank to revolt against occupation and its agents. The bloc mourned the death of the three Palestinians in a statement on Monday and charged that the massacre came at a time the PA was launching “humiliating” negotiations with the Israeli occupation. 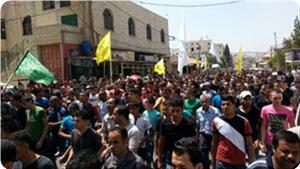 It said that the PA security coordination with Israel had facilitated the “cowardly act”. Meanwhile, thousands of angry Palestinians walked in the funeral procession of the three young men who were killed in the Israeli army raid on the refugee camp. Special sources told the PIC that undercover Israeli soldiers broke into the house of a citizen and tried to arrest him but neighbors and inhabitants confronted the attempt. They said that Israeli military reinforcements rushed to help the undercover soldiers out of the house and fired heavily at the civilians killing three and wounding 27 others five of whom suffered serious injuries. The Palestinian Authority on Monday called for the formation of an international committee to investigate the killing of three Palestinians in Qalandia refugee camp. PA spokesman Ihab Bsaiso told Ma'an that the international community has to put more pressure on Israel to stop violating the rights of the Palestinian people. "The international community should not stay silent about the Israeli crimes against our people, and an inquiry committee should be formatted to investigate what happened in Qalandia refugee camp," the PA official said. The Israeli government acts in a reckless manner without accountability, and the international community must take a strict position to stop these violations, Bsaiso said. Israel has proved once again that it is not interested in the peace process, he added. The Fatah movement in Jerusalem and Ramallah announced three days of morning for the three victims, calling on Palestinians to participate in the funeral processions in Qalandia refugee camp. Israeli undercover forces killed three Palestinians overnight Sunday and injured at least 15 people during an arrest raid in Qalandia refugee camp. Israeli occupation forces (IOF) used live bullets to disperse Palestinian protestors in Qalandia refugee camp, north of occupied Jerusalem, at dawn Monday killing three of them. Palestinian medical sources said that Rubin Zayed, Jihad Aslan, and Younis Jahjouh were killed in the IOF shooting while 15 others were wounded, describing their wounds as moderate to serious. Eyewitnesses said that IOF troops raided the camp to arrest one of the young men but citizens tried to prevent them. They added that the soldiers used live and rubber bullets in addition to teargas and stun grenades to disperse the protestors causing the casualties. They said that the casualties were evacuated to Ramallah hospital, adding that tension was still prevailing as young men continued to maintain presence near the IOF checkpoint near the camp. 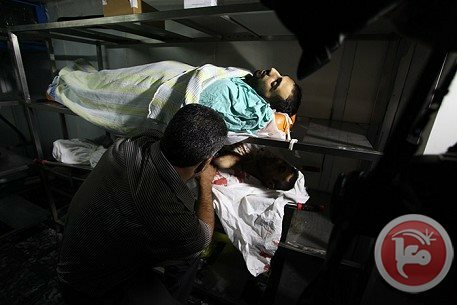 Israeli undercover forces killed three Palestinians overnight Sunday in Qalandia refugee camp in Ramallah, locals said. Both men were killed when Israeli forces opened fire on a crowd during clashes with camp residents following an arrest raid. At least 15 Palestinians were injured by live fire, with six said to be in a critical condition. Witnesses told Ma'an that Israeli forces raided the camp and arrested a recently released prisoner who had spent 10 years in jail. Dozens of camp residents quickly surrounded Israeli forces, who opened fire. Another Israeli military patrol then entered the camp. Three Palestinians, including one man released in the Shalit prisoner exchange, were shot to death by IDF forces this morning in Qalandia refugee camp, near Ramallah. The incident began when plainclothes soldiers who entered the camp to carry out arrests were exposed by local residents. According to reports in the Israeli media, after being attacked with stones and rocks, the soldiers used live ammunition to rescue themselves out of the refugee camp. Rubin al-Abed, 32, Yunis Jahjuh, 22 and Jihad Aslan, 20, died from the shooting. Palestinian sources are reporting at least another 15 wounded. 13 Palestinians have been killed this year from IDF fire in the West Bank. UPDATE: The Palestinian Authority canceled the next negotiation meeting with Israel following the events in Qalandia. Here are three clips from the events this morning. In the upper video you can see a couple of armed vehicles attacked with stones. The shots are clearly heard in the bottom videos. I believe it is a good idea for the US and other world countries to immediately stop aid to any country that shoots civilian demonstrators. This principle should be applied without exception. Double standards should not be tolerated when dealing with soldiers causing fatalities when confronting civilian demonstrators. While this principle is being discussed in regard to the use of force by the Egyptian security forces, there has never been any discussion about using the same punishment against Israel, which has killed many unarmed Palestinian demonstrators. UN resolutions allow for resistance, including armed resistance, to a foreign military occupation. Comparing the actions of the Egyptian security forces to the Israelis is unfair to the Egyptians. The Egyptians were accused of using excessive force in breaking up the Rabaa and Nahda sit-ins. But what about the Israelis? 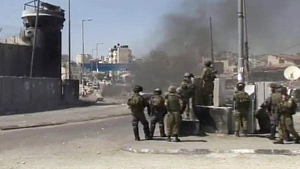 Amnesty International said the Israeli army used excessive force. In its report about the year 2012, a relatively quiet year in terms of Palestinian victims, this is what Amnesty International said: "Israeli forces used live fire and other excessive force against Palestinian demonstrators in the West Bank and protesters at the Lebanese and Syrian borders, and to enforce the 'exclusion zone' within Gaza and along its coast. They killed 55 Palestinian civilians in the OPT, including 11 children. Among them were 22 civilians, including nine children, killed by Israeli fire in Gaza's land and sea restricted areas. 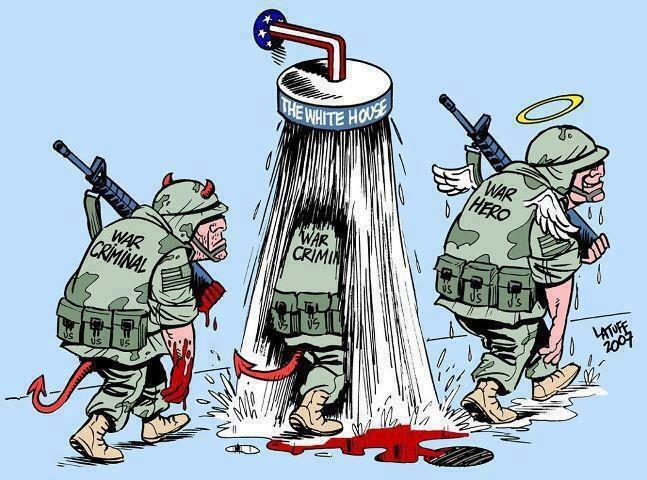 The army initiated internal investigations into some of these incidents, but these were not independent or transparent." The interim Egyptian government was chastised for ordering one-month emergency regulations while Palestinians have been living under occupation and emergency regulations for over 60 years. The new Egyptian government was attacked for its denial of freedom of expression by closing down pro-Muslim Brotherhood satellite TV stations accused by the Egyptians of inciting to violence. Amnesty International says the Knesset, Israel's parliament, passed laws restricting freedom of expression and association, including one which made it an offence to advocate a boycott of Israeli individuals or institutions in Israel or Israeli settlements in the West Bank. Another penalises commemoration by institutions or municipalities of the Nakbeh (catastrophe), a term used by Palestinians to describe their dispossession in 1948. The New York-based Committee to Protect Journalists reported that a record 232 Palestinian journalists were arrested in 2013 and that 12 were killed since 1992, and one murdered with impunity. A report by the Vienna-based International Press Institute stated that Palestinian journalists from Gaza and the West Bank are not allowed freedom of movement by the Israeli authorities who do not officially recognise the existence of the Palestinian media and only recognise Palestinian journalists working for foreign media. The concept that media is used to incite violence has been a major Israeli and pro Israeli crusade against Palestinians, while the latter's media and textbooks even after independent reports showed, clearly that Palestinian media and text books lacked any blatant Palestinian incitement to violence. The same cannot be said of some of the pro-Islamist Egyptian TV stations and speakers who were inciting to violence; public buildings, religious institutions and private property were attacked indiscriminately. The Israeli and Egyptian situations are totally different and must not be compared in any form. Nevertheless, it is possible to look at the attitude of the defenders of human rights and freedoms when it comes to excessive use of force, media restrictions and use of emergency regulations. When the US, Europe and other countries apply the same standards to Israel and Egypt consistently, people will take that position much more seriously. Thousands marched in the funeral procession of Majd Lahlouh in Jenin afternoon Tuesday and demanded revenge for his murder at the hands of Israeli occupation forces. The PIC reporter said that angry participants carried the body from the hospital to the graveyard in Jenin refugee camp amidst massive participation in the procession. Former minister of prisoners Wasfi Qabaha told the PIC reporter that the Israeli crime at dawn Tuesday carried a clear message to the Palestinian Authority mainly that Israel does not believe in peace. He said that the PA should learn the lesson and give up talks with Israel and return to its people and complete the national reconciliation. IOF soldiers stormed the camp at dawn Tuesday and used Dumdum bullets against young protestors killing Lahlouh, 22, and seriously wounding two others.